It was really nice to read what all of you wrote. I thank all of you from the bottom of my heart. It is really inspiring to know that everybody is so interested to learn more. Just having the desire to learn will lead to a lot of success. I assure you. When I started investing in the stock markets I was only sixteen and all I had was a burning desire to learn. I didn't have a lot of money or anybody else in my family investing. Just the desire to do something is enough. You know you are the best and you can do it. Since this blog is very new, a lot of things are going to be added. Our website- www.happionaire.com is also being developed and tested. A lot of things are now just being tested and figured out. I want to take interactivity and sharing of ideas with The Happionaire Way to the next level so that ideas and thoughts are shared without any barriers. 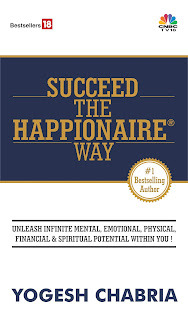 The book- Invest The Happionaire Way, would not be an end in itself but a starting point for a journey where knowledge can be used to create all sorts of wealth. Inshallah with your blessings it shall all be done. May Saraswti the Goddess of Knowledge bless you with Laxmi- the Goddess of wealth, happiness and health. Don't forget to subscribe to our blog via newsletter and to share your ideas. Happy Republic Day to you too Yogesh! I think your book would surely be a new benchmark in the world of publications since we would all have so much direct contacts with you. My intuition is telling me it will just be rocking. Thanks Yogesh. Wish you the same! What you write is really inspiring! You write from your heart sir and I can feel what you are trying to say. It not only helps me learn so many new things, but you make everything seem so nice and uncomplicated. You are a blessing for retail investors. I've larnt a lot from your ideas. I made good money investing in GMR when you had suggested it almost 2 years back very cheap. Thank YOU!